You may be asking yourself, “Can’t I just let my tree grow without doing any maintenance?” You may also say, “My tree looks fine to me. 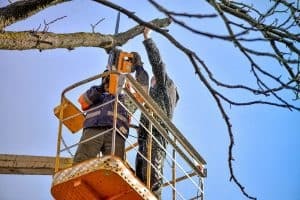 Why do I need any tree services?” The truth is that tree trimming and tree pruning are necessary aspects of your landscape regimen. These procedures help improve your tree’s appearance. However, there is also a deeper benefit of these tasks. Pruning services are done to provide protection to trees. When a tree is trimmed, it ensures that the tree grows correctly. The overall goal is to create a safe environment for you and your tree to exist together. No longer do you have to wonder about what your tree needs. If you live in Buncombe County or Asheville, NC, call Family Tree Services soon so that we can set your mind at ease. One of the most common reasons for failure of a tree is due to an unstable tree structure. When a tree fails, it can be expensive to have it removed. The option of tree pruning and trimming are much more cost effective and can increase the years of life for your tree. When these processes are performed in the correct manners, they can make the tree stronger and increase its ability to withstand the elements of nature. On the contrary, if done erroneously, the tree can become structurally imbalanced and cause a decline in tree health. When a tree gets too big, its ability to compensate for its growth pattern becomes limited. Due to this, many faults can occur. One issue that can develop is what is known as bark inclusions. This typically happens when over-sized limbs grow too large in number in one area of the tree. The extreme weight can cause a large section of the tree to snap off. A detachment of this magnitude can leave that section of the tree exposed and can lead to decaying of the tree trunk. Mishaps such as this can be avoided with regular pruning and trimming. In most instances, these services only need to be executed 1-2 times per year. However, the species of the tree will indicate the pruning frequency. To effectively prune a tree, the correct tools will be needed. Family Tree Services can provide quality tree analysis to ensure that the right tools are used. Shears are usually required for pruning. There are two different forms of shears: hand shears and lopping shears. Hand shears are smaller in size, held in one hand and are capable of cutting leaves and buds. For large branches, lopping shears are better suited for cutting. If all else fails, the tree surgeon performing the job will use a quality saw. If your tree appears to be disproportionate, too dense or filled with dead leaves and branches, do not ignore it! A tree can grow to be large in stature. However, certain characteristics of a very large tree are not customary. Trees that fall into any of these categories are good candidates for crown reduction. Reducing the crown consists of reducing the height of the tree. During this procedure, the main limbs located at the top of the tree are cut. The tree surgeons at Family Tree Services are able to advise as to if your tree needs this service. For crown reduction to be the most effective, cutting more than 60% of the size of the secondary branches is not recommended. Effective crown reduction can induce a more even growth pattern and allow sunlight to filter through the branches. Also, dead branches on the tree will be less of an occurrence. Trees that go a long time without pruning eventually begin to accumulate branches within the interior of the crown. Although this can provide a substantial amount of desired shade, the inside branches will be deprived of sunlight. This can result in an increasing number of dead or dying branches. Family Tree Services surgeons know how to handle this issue by using crown thinning. This is commonly considered a mixture of a haircut and weight loss surgery for trees. However, the good thing about crown thinning is that it does not cause any severe alterations in the normal shape of the tree. There are also times when tree branches grow too low to the ground. Low hanging branches can hinder pedestrians from walking on a sidewalk or hide important traffic signs. Trees that present these hazards need to undergo a crown elevating procedure. Removing limbs from the bottom of the tree does not cause harm to the tree as long as the branches are not too big. Also, it is important to not remove a large number of branches from one area. Crown elevating that involves cutting away too many branches at the tree’s bottom can also allow the sun to burn the trunk. However, when elevating the crown is performed using the right procedures (which includes removing a branches in small increments), tree health is maintained and safety can be restored. Family Tree Services is currently extending service to Buncombe County and Asheville, NC. We feel that we have an obligation to assist you by making your tree(s) look its best while preserving your safety. Call us today and don’t delay! There are three unique types of pruning that we use depending on the project you need performed. Each has it’s own objective and trust us when we say we’ll be very careful in deciding what’s needed for your tree. This is probably the most common form of tree pruning we perform for residential or commercial customers. It involves the trimming or cutting of smaller branches within the crown. It will create an even or uniform density throughout foliage all the while allowing more light to pass through toward your lawn as well as better air flow. An increase in airflow efficiency will allow your tree to have far better defense during severe storms. Our trimming will also lessen the weight of heavy branches on the tree’s structure thereby increasing safety and reducing liabilities. Do you have a problem where your tree’s branches are growing way too close to the ground or sidewalk where people commonly walk? If so, Crown Lifting might be the right option for you. In this procedure, our experts will strategically trim some of the lower branches allowing for far more ground clearance so people are constantly worried about walking into hanging branches. We can help you provide additional clearance for branches that have grown above sidewalks, walk-ways, driveways, garages and more. For branches that are wildly growing out of control or a tree that hasn’t been cared for in years, this is the optimal form of pruning needed. For example, if your tree’s branches are growing into your neighbor’s windows, or if branches are obstructing your own view. We will carefully trim lateral branches to a safe point where wounds will not be a problem and the branches will grow back safely. We trim to a safe point which is usually 1/3 of the diameter of the branch which is removed. Virtually any type of tree that is able to produce fruit will naturally benefit from pruning. We have plenty of experiencing properly pruning or trimming fruit trees because it allows for much better fruit production. This type of pruning is important to us and you, because you should see immediate results. Fruits can bring in insect infestations. So can dead wood. Our fruit tree pruning professionals will trim away any dead or diseased branches which will also allow for an increase in the growth of spurs. This means you’ll see a large increase in fruit production the following season and enjoy all the fruit you can!